The ETS Cat-Back Exhaust System is an effort for all out performance on the EVO. The 3.0" or 3.5” Mandrel bent stainless steel piping, and a Vibrant Performance muffler make for a performance and appearance combination that can't be beat. This system starts at the cat and tucks closely in to the driveshaft tunnel allowing near factory ground clearance. The piping expands to a full 4" before meeting the 4" muffler inlet and exits via a 4" tip at a 15 degree angle. This setup offers both race-inspired looks and ultra high performance capacity. This exhaust uses the factory rubber hangers and includes the hardware necessary for an easy, bolt on installation. 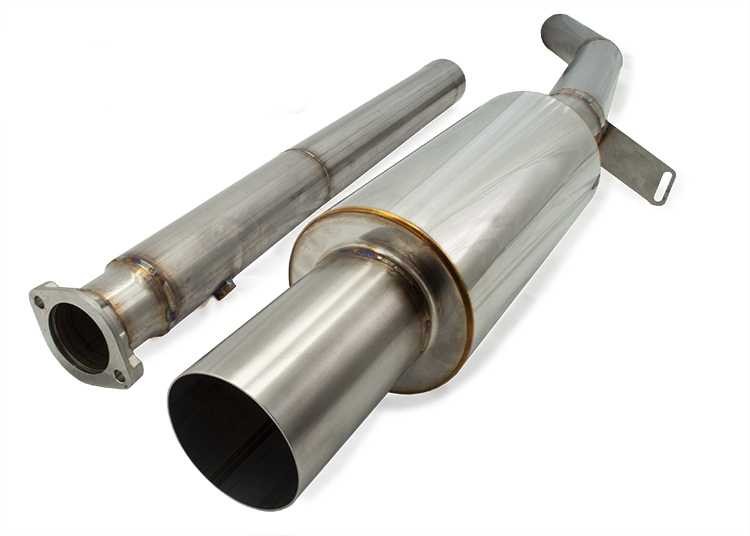 The downpipe-back version of the ETS 3.0" or 3.5" Exhaust is for serious race vehicles. This exhaust totally replaces the cat and bolts right up to your stock or aftermarket 2-bolt downpipe. This takes full advantage of the 3.0" or 3.5” diameter piping and gets the transition even closer to the turbo for maximum horsepower capacity.